TALLAHASSEE, Fla. (AP) – Republican Gov. Rick Scott’s campaign suggests in a new ad that former Gov. Charlie Crist has something to hide by not releasing his wife’s tax returns, while Crist said Wednesday that Scott is “hitting below the belt” by dragging his wife Carole into a negative campaign ad. Scott last week released the joint tax return he filed with his wife Ann and called on Crist to do the same. The same day that Crist released three years of tax returns for the three years since he left the governor’s office, the political committee working to re-elect Scott released a statewide ad criticizing Crist for not releasing his wife’s. Unlike the Scotts, the Crists file separate tax returns. The ad also negatively refers to Crist as a millionaire, a status he only recently, and barely, achieved. 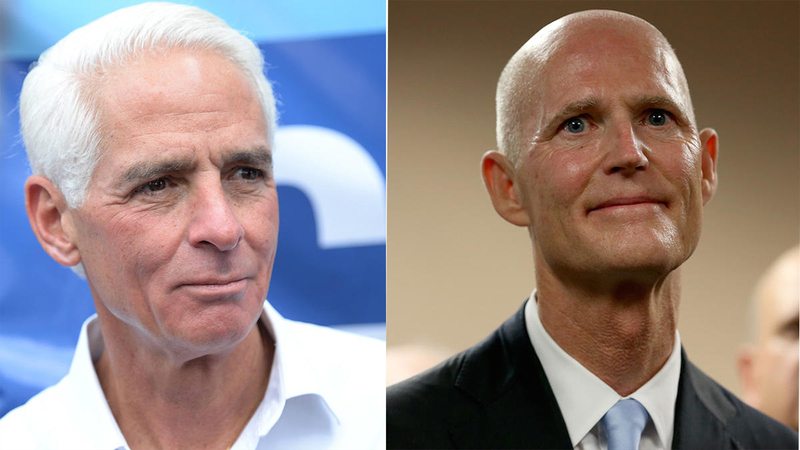 Crist has a net worth of $1.2 million, less than the value of Scott’s $1.5 million vacation home, according to financial documents listing income and assets that both candidates are required to file. Crist, now a Democrat, was never worth more than $1 million while serving as a Republican governor from 2007 to 2011. Scott has a net worth of $133 million. Crist’s tax returns showed his adjusted gross income in the three years since leaving office ranged from $541,369 to $704,881. Neither candidate is required to release his federal income tax returns, but Florida gubernatorial candidates have traditionally done so. Whether governors and their challengers release tax returns varies from state to state, but the practice is voluntary. For example, Texas Gov. Rick Perry releases his, while California Gov. Jerry Brown doesn’t. Scott said in a written statement released by his campaign that Carole Crist’s tax returns should also be released. While Scott’s campaign has repeatedly called on Crist to debate a lesser known and poorly funded rival, former Senate Democratic Leader Nan Rich, Scott didn’t ask Rich to release her or her husband’s tax releases. Rich didn’t immediately return a call or email asking for comment on the issue. Whether the attack on Crist will resonate with voters is questionable, said Susan MacManus, a University of South Florida political science professor. “In an era when so many women are independent and file separate from their husbands, this may not particularly play well with that constituency,” she said.